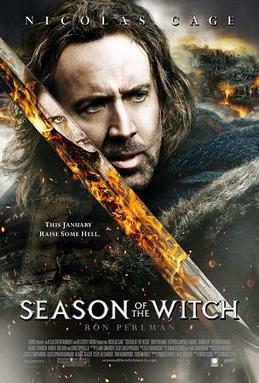 There’s this trailer running on TV at the moment, about a new movie that’s out, called Season of the Witch. It’s like The Sorcerer’s Apprentice all over again! Nicolas Cage with That Hair! That’s got to be worth a watch, especially with witches and 14th century and co-starring Ron Perlman and Christopher Lee. It all adds up. But oh, Cagey, keep the hair, would ya? Pleeeease? Don’t listen to Collider, who think it looks silly and fake and all that. But we probably won’t see it until it comes out on DVD. But then at least it’s something to look forward to. 5 Responses to "The top reason to watch Season of the Witch"
yay.. not the world’s biggest fan of Nicky (dig the hair and costume though 🙂 but as you said – witch, crusader, 14th century .. count me in. thanks for the alert, might have passed me by in the current chaos. I’ve been watching lots of medieval films and series lately and will keep my eyes peeled for German start date. OMG – I’ve just ogled the GINORMOUS production stills http://www.celebritywonder.com/movie/2010_Season_of_the_Witch_photos.html… and feel a bout of manipulations coming on. It’s such a shame that Cagey Nick lost most of my respect over the years: Loved him in ‘Moonstruck’ & ‘Rasing Arizona’ but after his spousal abuse cases & financial fiascos, Nick fast became as unpopular as Mel “Open-Mouth-Insert-Foot” Gibson for many. For me the last straw was him starring in that abysmally misogynistic & totally unecessary remake of ‘The Wicker Man.’ As a Pagan & a feminist, I found this waste of a remake doubly offensive & just plain ugly. Cage lost my movie vote from then on.